This addition adds force powers to the game, actions that cause stress, energy, an official force builder app, adds a new medium base size, and of course the new game changes card and template formats. Point values will no longer be printed on cards, and will instead reside only in the app, which will also allow for prices of upgrades to vary based on the ship you attach them to. 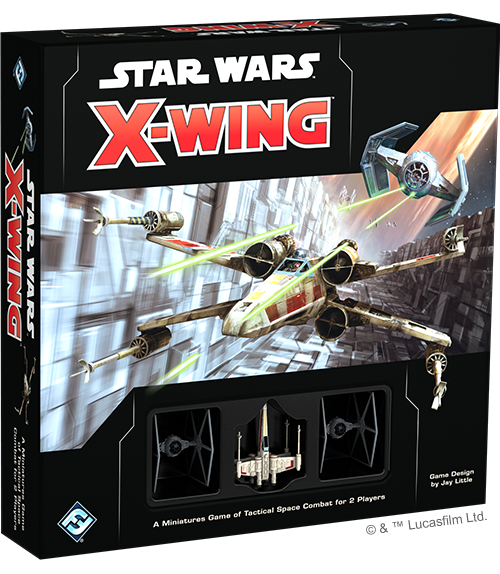 Fortunately for those of us with existing X-wing collections, FFG is producing conversion kit for each faction ($50). How kind! [and it looks like you would have to buy two conversion kits for the traditional 8 TIE/ln force]. New packaged ships will cost $5 more than previously too, so FFG is being very kind indeed. Now if only this causes retailers to dump their existing inventories! I wish X-Wing had caught on more at our house. We never got past a few introductory games. I was not aware of this! I’ll have to investigate. I do like xwing and have a small amount of ships to fill my needs. Apparently there is at least one new maneuver and a new damage deck, so you have to buy a new core set as well, not just a conversion kit. So, say that a player that has a lot of imperial and rebel ships and who likes to play both factions wants to be able to use his collection, then he or she has to fork out around $140 (two conversion kits and new core game). I think that for a casual player, there is no reason to jump to 2nd edition, but if you ever go to a shop tourney you will have to. Given that I have both imperial and rebel ships, and have more than four TIE/ln fighters, I think that I would be in for $190... which would also give me a huge swath of cards and three new ships (including the X-wing with the folding wings! ), but still. Of course, I have other things that I would rather spend that money on! We have a bunch of X-wing stuff, but just don't play it all that much... As you say, hopefully shops will blow out their first edition stuff and I might finally get around to picking up an Millennium Falcon... But other than that, I'm not all that concerned. I bought in when the boy briefly got all excited about one of the FFG Star Wars role-playing games. Picked up a bunch of stuff from Book Depository in the UK as it was super cheap at the time. I even build a big star field board to play on! Then we all got interested in 40K... Ah, well... Maybe we'll play some Battle Fleet Gothic on that star field board I made! I have a small collection, but have played the 1st edition perhaps 5 times? No point in getting into a new one, especially at those prices. Do like the new X-Wings though. Sadly it's fairly rare that a retailer would dump Star War inventories. But with the overload of merchandise ever since Disney took over it could well likely be possible. Come to think of it there has been some steep discounts on occasions back where I'm at ... rare ... but they do happen. @Maj. Guiscard I just saw your comment, and have no idea how to contact you directly! Email me at blog name @ yahoo.com please.